A victory for the safety of people in bear country recently occurred when the Interagency Grizzly Bear Committee (IGBC) took unanimous action to clarify its bear spray recommendations. Comprised of representatives of various state, federal, and Canadian wildlife management agencies, the IGBC helps coordinate the recovery of grizzly bear populations, and provides public information about bear safety and the use of bear spray. The IGBC has historically recommended that bear sprays have a minimum duration of six seconds. Recently, however, the IGBC adopted a new policy that recommends the use of any EPA-registered bear spray product without reference to spray duration, that is, the time it takes for a can to discharge completely. The IGBC correctly recognized that existing federal bear spray registration standards are adequate for public safety and that consumers should follow the manufacturer’s instructions for proper use of their selected bear spray product. Exercising its collective professional judgment, the IGBC appropriately withdrew its outdated six-second spray duration recommendation, which lacked any scientific or empirical justification, and conflicted with modern bear spray studies. Following the IGBC’s decision, UDAP has received various inquiries about the meaning of and reasons for the IGBC’s action. Many of these questions appear to have arisen from a misunderstanding of how bear spray is regulated, how it is intended to be used, and from incorrect or incomplete reports in the media. The following Question and Answer narrative is intended to provide clarity for those who have reasonably been left confused by recent media coverage. Customer safety is UDAP’s number one priority, and we feel an obligation to provide clear, accurate, and complete information to our customers. If you have questions or need further information, please do not hesitate to contact UDAP’s leadership here, or visit UDAP’s website. We would be delighted to hear from you. Bear spray is considered a pesticide and is regulated by the U.S. Environmental Protection Agency (EPA) pursuant to broad authority granted under the Federal Insecticide, Fungicide, and Rodenticide Act (FIFRA). FIFRA establishes that all pesticides sold or distributed in the United States must be registered by the EPA. Registration is based on evaluation of scientific data, product performance testing, and assessment of the risks and benefits of a product’s use. Currently, there are only four EPA-registered bear spray products on the market. The EPA also regulates pesticide labels and instructions, which allows the agency to control how products are used. It is unlawful for any person to use a registered pesticide product, such as bear spray, in a manner inconsistent with its labeling. What role does the IGBC have regarding bear spray? Unlike the EPA, the IGBC does not have statutory authority to regulate bear spray, or its registration, labeling, or use. Instead, the IGBC’s mission is to “Recover, manage, and secure the future of grizzly bear populations and their habitat so that grizzly bears no longer require protections afforded by the [Endangered Species Act].” The use of bear spray is an important management tool that serves the IGBC’s mission by helping promote the recovery and survival of the grizzly bear as a species. Bear spray is a powerful, non-lethal deterrent that, when used correctly, can stop a bear attack or lessen its severity without permanently harming the animal. It is an effective alternative to lethal personal protection options, such as firearms, and its use can both reduce human injuries caused by bears and decrease the number of bears killed in self-defense. For these reasons, the IGBC recommends bear spray when used in conjunction with proper bear avoidance safety techniques, and has historically provided the public with guidelines for selecting an adequate bear spray product. What was the IGBC’s recent action? The IGBC recently revised and clarified how it will provide the public with information and recommendations about selecting bear spray. During the infancy of commercial bear spray development in the 1990s, the IGBC established a set of bear spray guidelines that included such things as recommended spray distance and pattern, concentration of active ingredient, minimum net weight, and minimum spray duration. For years, the IGBC recommended the use of bear spray with a minimum spray duration of six seconds. On December 13, 2016, the IGBC Executive Committee unanimously withdrew the six-second duration guideline in favor of recommending the use of any EPA-registered bear spray product, without regard to a numeric bear spray duration criterion. The IGBC recognized that EPA’s current bear spray registration standards are adequate, and it committed to rewriting its bear spray guidelines so that public has the most accurate and reliable information available. The IGBC will publish its revised bear spray recommendations by the end of February 2017. Please note that the IGBC’s action does not, in any way, allow for the production of small, palm-sized pepper sprays to be marketed as “bear spray.” EPA’s pesticide registration requirements prevent this from occurring. What led to the IGBC’s clarification of its bear spray recommendations? That the IGBC fulfill its promise not to promote or endorse one commercial bear spray product over any other. The IGBC agreed to consider UDAP’s requests and formed a bear spray work group to evaluate its bear spray recommendations and appearance of implied product endorsement. At the IGBC’s winter meeting on December 13, the work group reported its findings to the Executive Committee and recommended taking action consistent with UDAP’s request. Upon the work group’s recommendation, the IGBC unanimously agreed to continue to recommend use of EPA-registered bear spray products and to rewrite its bear spray recommendations/guidelines without reference to a numerical spray duration criterion. The IGBC also agreed to continue to be vigilant and conscious not to promote or endorse any one commercial bear spray product over another, and decided to add an additional disclaimer to its website. The IGBC’s actions are good for public safety and government transparency. In revising its bear spray recommendations, the IGBC has embraced science and sound professional judgment, and demonstrated a commitment to providing the public with accurate, reliable, and meaningful information about bear spray. Did UDAP file “legal action” against the IGBC? No, contrary to erroneous media reports, UDAP has not filed legal action against the IGBC in any court or administrative body. UDAP presented its concerns in an open public forum at the IGBC’s regularly scheduled summer meeting. UDAP submitted written materials and a PowerPoint presentation for the IGBC’s review and consideration, and engaged the IGBC in a professional, courteous, and productive manner, without any need for litigation. What were UDAP’s main concerns in bringing this issue to the IGBC? UDAP’s main concerns were: (1) public safety, (2) the need for accurate public information about bear spray, and (3) the basic notion that bear spray recommendations ought to be grounded in sound science, not speculative opinion. Consistent with Dr. Smith’s observations, EPA-registered bear spray products have proven to be effective, non-lethal tools for deterring bear attacks, and there is no evidence that any EPA-registered bear spray product is unsafe or inadequate for its intended purpose, even though a majority of bear sprays do not meet the old six-second guideline. There is an obvious disconnect between the six-second guideline and the actual performance and efficacy of bear spray in the field, and as long as the six-second guideline remained in circulation, the public was not receiving the most accurate and reliable information in selecting bear spray. UDAP – with the support of another bear spray producer, scientists, experts in human-bear interactions, and users of bear spray – contacted the IGBC to voice its concerns and set the record straight on the six-second rule. Upon review of UDAP’s presentation, written submissions, and its own independent research, the IGBC unanimously decided to remove the duration guideline from its public recommendations. It is anticipated that the IGBC will publish its revised bear spray recommendations and white paper by the end of February 2017. UDAP supports the IGBC’s decision, and applauds the Executive Committee’s efforts to provide the public with accurate information concerning bear spray and its use. The IGBC members showed leadership and interest in public safety by basing its decision on available science and proven experience, rather than the speculative opinions of those advocating for an arbitrary six-second rule. Those living, working, and recreating in bear country are safer today and will gain more confidence in the use of bear spray due to the actions of the IGBC and its clarified recommendations. Removal of the six-second rule will also eliminate favoritism, alleviate concerns about implied government endorsement of commercial products, and contribute to better public education concerning bear spray. Those looking to purchase bear spray should seek out an EPA-registered bear spray product and follow the manufacturer’s instructions printed on the label for its proper use. If you wish to learn more about the underlying fallacies of the six-second guideline, please see UDAP’s written submissions to the IGBC, here and here, and its PowerPoint presentation, here. Where did the erroneous “six-second” recommendation come from? The origin of the six-second spray duration recommendation is shrouded in uncertainty. What is known is that in the late 1990s, when commercial bear spray use and development was in its relative infancy, the IGBC tasked the Yellowstone Ecosystem Subcommittee (YES) to issue a bear spray position statement to inform and educate the public about the use of bear spray for self-defense in the backcountry. The YES committee recommended bear spray with a range of 25 feet and use of the “largest size” can available, to accommodate things like environmental conditions (wind, rain, cold), highly agitated bears, multiple bear encounters, multiple charge encounters, and having reserve spray for the hike out. The IGBC subsequently outsourced its review of bear spray to the Center for Wildlife Information (CWI), a now defunct non-profit organization which was led by an individual without any formal scientific training and who is believed to have had a close association with the only bear spray company (at the time) to produce a can that sprayed for longer than six seconds. In 1999, CWI presented its bear spray recommendations and urged the IGBC to adopt a six-second spray duration guideline, which it did. It was at this time that the YES committee’s original recommendation to use the “largest size” can available was transformed into a numeric duration recommendation. While the six-second duration recommendation has persisted for years, the underlying basis and justification for the guideline has never been substantiated with scientific or empirical data, despite repeated inquiries and a formal request under the Freedom of Information Act, 5 U.S.C. § 552, for documents, studies, reports, and any other supporting information. The lack of any supporting documentation calls into question the transparency and neutrality of the process, reasoning, and justification for the six-second rule. Promoters of the duration guideline continue to refer to the research of Dr. Charles Jonkel and Carrie Hunt from the 1970s and 1980s to support their position. While the importance of Dr. Jonkel’s and Ms. Hunt’s research to the development of bear spray as an effective deterrent cannot be overstated, their work simply does not conclude or provide direct support for any numeric duration guideline, let alone a six-second requirement. At most, Ms. Hunt’s research suggests the need for bear spray that has “repeated application,” which all EPA-registered bear sprays are capable of doing. Moreover, Dr. Jonkel’s and Ms. Hunt’s research predates the EPA’s regulation and oversight of bear spray, and so they lacked any opportunity to test the performance and efficacy of the products now on the market, which significantly limits the relevance of their research to the question of duration. Another misperception commonly held by proponents of the six-second rule is that six seconds is needed to compensate for various contingencies, such as repeated attacks, multiple bear scenarios, weather, and the hike out. These scenarios do not, however, lend themselves to a quantifiable duration standard and they fail to establish why six seconds is the “magic” number to accommodate all these situations, as opposed to some other number. What these scenarios do suggest is the need for a bear spray capable of deploying repeated bear-stopping bursts. As the IGBC’s own bear spray testing shows, even a 7.9 oz can with a four-second discharge time is more than capable of accommodating these various scenarios, assuming it is deployed properly (i.e., using one-second bursts, as per manufacturer instructions). Moreover, these scenarios can be accommodated in other ways, such as recommending use of the largest volume canister of spray, as the YES committee suggested, or by carrying multiple cans of bear spray. If not duration, what is important when choosing a bear spray product? 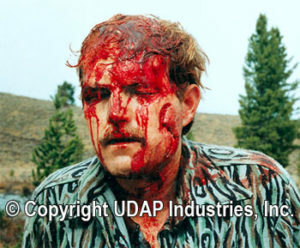 As a grizzly bear attack survivor, Mark Matheny – the founder and president of UDAP – encourages the use of a high-volume spray. Published studies demonstrate that in many bear encounters an individual has less than two seconds to react before the bear makes contact. In these situations, it is not a matter of how long the can sprays in a constant duration, it is a matter of how quickly the product can deliver a bear-stopping dose of spray. Bear spray is specifically designed to be deployed in repeated bursts, and UDAP bear spray, in particular, is designed to deliver a powerful, high-volume spray with each burst, when it’s needed most. Given bear spray canisters with equal potency and spray characteristics, other than duration, would you rather have the spray that comes out slower (longer duration/lower volume) or the one that comes out faster (shorter duration/higher volume) if a grizzly bear is charging at you? In addition to having a high volume, bear spray should be registered by the EPA and be clearly labeled for use on bears. It should spray in an expanding fog pattern with sufficient distance to intercept a charging bear, and it should contain the highest concentration of capsaicin and related capsaicinoids regulated by EPA (currently, 2.0%). The net weight of bear spray should be at least 225 grams or 7.9 ounces, as required by the EPA, and it should be capable of providing repeated bursts of spray. While the above considerations are important for selecting a bear spray product, it is even more critical for the user to be familiar with the specific performance characteristics of their chosen product and to understand and follow the manufacturer’s instructions for its use . . . and to practice. I have seen numerous instructions for the proper use of bear spray, but they are not always consistent. Which one should I follow? You should follow the manufacturer’s instructions printed on the label of your chosen bear spray product. Bear spray is regulated by the EPA and federal law requires users and consumers of bear spray to deploy the product in a manner consistent with instructions on the label. Unfortunately, there is an ever-increasing amount of conflicting information about the proper use of bear spray being produced in media reports, government websites and publications, and by special interest groups. While the intent of these sources is to educate the public on how to effectively use bear spray, the unintended consequence has been consumer confusion and misunderstanding. It is critically important to recognize that not all bear spray products perform in exactly the same manner, and the variability in performance characteristics across product lines makes it exceedingly difficult and counterproductive to develop a set of generic bear spray recommendations to apply across the board. For example, some sources instruct users to “spray for 2-3 seconds” when the bear is approaching. This instruction ignores the fact that not all bear sprays discharge the same amount of active ingredient per unit of time. For instance, a one-second high-volume burst from a UDAP can may discharge the equivalent amount of active ingredient as a two- or three-second burst from another brand of bear spray. UDAP’s EPA-approved instructions direct users to release a one-second burst of spray as an attacking bear is charging. To instruct a UDAP user to unnecessarily deplete his or her canister with a two- to three-second spray is not only irresponsible and dangerous, it also encourages use of the spray in a manner inconsistent with its label. Other sources instruct the use of a zig-zag pattern or a side-to-side movement while spraying. This action is completely unnecessary for UDAP products, which have a broad spray pattern and are designed to billow outward in an expanding fog. Using a side-to-side motion while spraying not only wastes bear spray product, it decreases the effective distance the spray will travel, as can be seen in this video. Bear spray producers continually test their products and develop specific, EPA-approved instructions for how to most effectively deploy the spray given the canister’s specific performance characteristics. Users should understand and follow the instructions printed on the label of their chosen bear spray product. Please, tell me more about UDAP. There are more people than ever recreating, hunting, fishing, and enjoying the wild lands of North America and elsewhere around the globe. In many cases, they are doing so in the midst of prime grizzly/brown and black bear habitat, which has led to more conflicts among humans and bears than ever before. With bear populations on the rise, the need for a reliable and effective bear deterrent is as important as ever. At UDAP Industries, we provide our customers with bear spray and personal protection products that help keep people safe in bear country. Our bear spray products are powerful and robust, with several sizes, including the largest can of bear spray on the market. Our customers tell us that the power and reliability of our products is the reason that UDAP bear spray is one of the most trusted and relied upon bear spray products available in the marketplace. Be prepared, carry bear spray, read the label, and know how to use it. Practice makes perfect sense. 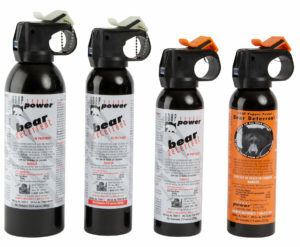 For more information and bear safety tips visit www.BearSpray.com. 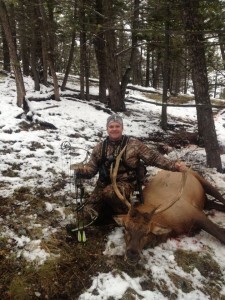 The archery elk season in Montana is underway. And, for the archery elk hunter who has spent his summer exploring remote stands of timber most hunters only glance at on Google Earth, while hiking countless backcountry miles and prematurely wearing the sole from a pair of hunting boots, congratulations on your effort and good luck on this seasons hunt. For those hunters, however, that haven’t spent as much time in the backcountry this season, or for those hunters that aren’t sure how to effectively scout for the season, here are a few tips to help. When you are out scouting, the most obvious signs of elk activity are droppings, tracks, and rubs. Elk are transient by nature, so being really excited about evidence of elk may be jumping the gun, so to speak. Pay attention to the freshness of the rubs on the trees, or the prevalence of the tracks, and know that it only means that elk may frequent that area, and there are a few other ways of figuring out more precise locations and patterns for the elk when the rut begins. If you are scouting and you find a bull before the rut has begun, don’t be too excited. That bull most likely will be somewhere else when the rut actually begins. So, when you are doing your preseason scouting, make sure to pay attention to the cow elk. When those cows go into heat, those bulls wont let them out of sight. Also, while scouting, look for elk wallows (areas where bull elk may tear up the ground to reach the mud and moisture). When the rut is on, elk will use a wallow every day, most likely in the heat of the afternoon, so knowing where fresh or old wallows are is a big advantage. Those bulls run really hot during the rut, and rely on the mud and moisture from those wallows to cool down. Areas to look for that could be potential wallows are in meadows – pay close attention to the edges of the meadows where moisture may run off and collect. Also, look for bright green patches of grasses on densely timbered slopes. Near creeks and lake are obvious choices, and also near beaver dams. 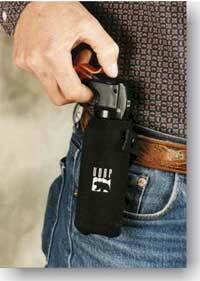 And don’t forget your UDAP Bear Spray and have it accessible in a UDAP holster while you are bow hunting this season! In the back woods of Big Sky Country, sportsmen have found a flyfishing paradise in the secret nooks and crannies of Montana’s wilds. Over the years, the secret to the best fishing spots have spread, and Montana has developed a reputation for some of the best flyfishing in the country. The vast amount of blue river waters, stretching for hundreds of miles, all over the states, ensure that anglers are able to spread out and have their own piece of the water in any of the popular flows. Located near the Prior Mountains in southern Montana, the Big Horn River is known for its productive waters, given a year-round insect season which draws in the catch. During peak fishing times, the average catch is around 17 inches. In the fall and winter the crowds may wane, but the fishing lives on, with most sportsmen suggesting streamer flies suggesting minnows, which are the most successful at attracting brown trout migrating down the river. The Big Horn is well-known around the world for having the highest concentration of trout than in any other North American river. Yellowstone, one of the greatest national parks in the U.S. is what many have argues is the epicenter of the best trout fishing on the globe. The mighty Yellowstone River, has produced some of the best catches around, with more than 100 miles of fishable river. Some fishermen have been known to use drift boats or white water rafts, equipped with fly fishing equipment. Some of the most common catches include Cuthroats, and Big Browns, many exceeding 20 inches. Pre-run off, usually March to April is one of the best times to real in these monsters. In August, it’s easy to fish up hoppers and pre-spawn Brown Trout. Hiking is a fun past time that brings out the most adventurous at heart who wish to experience complete nature submersion, as well as physical challenges that promote a healthy lifestyle. While it may be tempting to just take off into nature, there are some important tips that can help you enjoy your time hiking even more. With some attention to some key details, you can be sure to have a fun and safe hike. Hiking is something that like the boy scouts, you need to be prepared for. Research what each trail consists of before venturing down it, so that you know what you are up against, and are able to bring the proper equipment, according to the Grand Canyon National Park Service. Plenty of water is essential for any hike. It is also important to bring energy boosting snacks. An extra supply is also a good idea, in case of an emergency. One should also be aware of the weather, and make sure to dress appropriately and wear sunscreen. When venturing out on a hike, use the buddy system and to try not to hike alone. Hats, UDAP Bear Spray Backpack, non-cotton clothing, bandanas, ID, healthcare cared, and credit card, and a first aid kit with a fire starting mechanism are useful tools to have when embarking on a long hike. When you are enjoying nature, and the unspoiled natural environment you are in, it is important to leave the environment in the condition in which you found it, according to Alexander Davies of Discovery News. With the exception of picking up human waste and litter left behind by former hikers, it is best to leave the natural habitat as it is. If rock piles are discovered, you should leave them be. You should not carve out new trails, or destroy living matter. You should not do anything that would cause the natural living organisms of the wild to experience any difficulties; causing them to become sick, or even die. This is to ensure that the cherished natural spaces remain in such a state for future generations to come. You must be respectful of nature, and do all that is possible to reduce their impact and footprint upon it. It is as beautiful as it is still because of its lack of human inhabitation. In addition to the above-mentioned food, water, and clothing, you should be sure to carry a compass, pocketknife and map. If the hike takes place where the weather gets cold, it is best to bring warm clothing. When camping overnight, it is key to have really great gear such as a UDAP Bear Spray, tent, camping pad, sleeping back, backpack, etc. These can aid in your survival, not matter how rough the conditions. You may encounter a wild animal, or several during a hike, make sure that you are carrying your UDAP Bear Spray. Be sure to research the wild animals of the area that you are going to be hiking in, as well as studying these animals, and the ways in which you should interact when faced with such a confrontation. Be respectful of the animals and know which plants are edible, as well as which insects, spiders, and snakes are poisonous. Having the best hiking equipment can aid in preparations for what is ahead. Protection from harmful forces is greater when the equipment used is of the highest quality. Summer has finally arrived! Woohoo! Let the camping and hiking begin. If you are heading to bear country, don’t forget to bring along your UDAP Bear Spray! Being prepared in bear country can be the difference between life and death. And now, you can stay safer than ever before! UDAP now carries the Back Attack Pack™, which allows you to protect yourself from unexpected charges from behind, AND even when you’re pinned on the ground. Yes, you still have a line of defense! Produced by a grizzly bear attack survivor, this product is a must-have. To be used in addition with UDAP bear sprays as a backup only. So go out and enjoy the summer, enjoy bear country, and be SAFE! Here is a list for traveling safely in Bear Country! Where should I keep my food? UDAPmakes bear electric fences for the backcountry including electric fences for food storage and camping. Keep the bears out with BearShock! don’t leave pet food or garbage in areas where bears can get to it. Place garbage in a heavy duty-duty, tied bag. Put the bag inside a garbage can with a bear-proof lid. Beehives attract bears. If you have hives put them up high on hear-proof platforms. 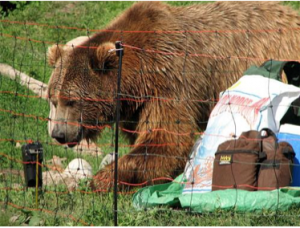 Keep your food and equipment safe In Bear Country! Make noise, let bears know you’re there. Travel in groups. Groups are noisier and there is safety in numbers. Stick to worn paths and trails and hike during the day, not at night. Watch for bears for signs of them, including bear tracks and droppings. Avoid areas where you spot potential bear food. Don’t forget to carry your UDAP BEAR SPRAY! Bears came out of hibernation early this winter on the west coast due to abnormal dry winter and drought. Because of these same weather conditions, black bears may come down closer and closer to where people are looking for food. Do you have your bear spray handy and/or a plan ready for a black bear encounter? To learn more about the black bears coming out of hibernation early, you can read this article published by CBS news! Please, help me out here, I am hiking up a jagged trail on the mountain side, enjoying the hike and the beauty of the great outdoors. I come up behind you rocking out to music or in all honesty, you may be listening to book while you are out hiking in nature. You are hiking along with headphones muffling all noise except that which is being pumped directly into your ears. The problem, you don’t hear me come up behind you which means that if there is a bear or wild animal on the trail, you’re not going to hear them either. You are not fully aware of your surroundings. Wisdom is better than strength, be prepared! We all want to stay safe out there, so no headphones or at the very least, just wear one ear bud so that you can hear the sounds around you, like a charging bear! Mystic Lake is a 7 mile out and back trail located near Fishtail, Montana. The trail is primarily used for hiking and is accessible from May until October. The Beaten Path (Backpacking) is a 26 mile point-to-point trail located near Roscoe, Montana and is rated as moderate. The trail is primarily used for hiking and is accessible from June until November. Beartooth Highway: Silver Gate to Red Lodge is a 70 mile point-to-point scenic drive near Red Lodge, Montana. The trail is primarily used for birding, mountain biking and scenic driving and is accessible from June until October. And while you’re out hiking in Montana this spring, protect your backside! UDAP offers the first revolutionary change in bear spray delivery in 20-years! The Back Attack Pack™, be prepared for your hike as well as any wild animals that may come charging along the trail.